Well Rudolph day has really crept up on me this month. Tonight we set back our clocks so we get an extra hour of sleep - always assuming we make it to bed on time! I could do with an extra hour and some, in every day right now. However, I have been trying to get ahead with my Christmas cards and, fortunately I kept a little set of four aside, ready for this challenge. I seem to have deleted the photo of the single one I would normally have put here first, and I haven´t the time to do it again, so straight away I will show you the one of the set of four cards that I made. I used a new Justrite stamp that I bought in a ´specials´order recently. It was complete as you see it here, but I wanted different colours, so after a bit of ´faffing around`, I stamped the whole image with versfine ink and masked off the centre while I embossed the scrolls around the edge with bright gold powder. Then I inked just the centre with rhubarb stalk Memento ink, and stamped it onto snippets of white card, and embossed them with clear powder. I cut the scroll border and a mat - red card for three, and green mirri-card for the fourth one- using two sizes of my first ever set of dies, the scalloped circle nesties. I used a plain circle die to cut the centre, and I made a mask frame a little smaller than the die, so I could add green ink around the edge of the centre without spoiling the red outer circle. Then I mounted the centres over the scrolled frames and added them to the cards. Each one is on a 12cm square, white base card, (I know the top left one doesn´t look white, but it is! ), a mirri-card mat, (with it´s centre removed because I am very careful with my mirri-card which I can only buy when I have a trip to UK), and then a backing paper taken from a Dovecraft, Back to Basics, 6 x 6 pad. I´ve had it for several years and not used it, but this year I have turned to it several times. A small gold organza bow added to the top of each one, and that´s four more cards to add to my stack. I have over a hundred ready now, and for the first time ever, they all have their inserts, an envelope and a label on the back. That was my best idea for this year, and I didn´t put any of them away until they were complete and ready to use. I still need to do a couple of batch bakes to reach the total I need, but I don´t feel under pressure like I did last year. So thanks to Sarn, for keeping us up to the mark all year. Now I will go and link up with the other Rudolph players, and see what they have been making. Join me over at Sarn´s blog, Stamping for Pleasure, and maybe link up a couple of your own Christmas cards too. Four really lovely cards and a great image with lovely papers, great design too. Look at you making four cards for the challenge! Way to go! Those lacy circles look so pretty and festive! Great choice of papers too! These are so lovely, Kate. The gold mirri card mat and the gold embossed stamped pattern look so elegant. What sweet cards Kate - elegant and ever so pretty. 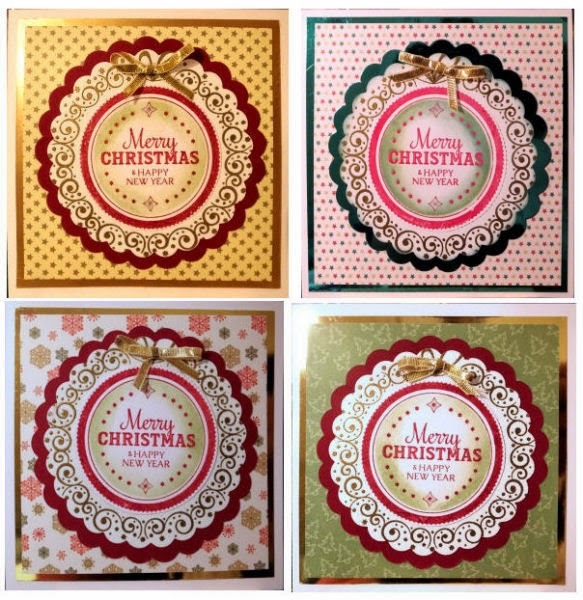 These look lovely Kate, I love the stamp you used especially the the gold scrolls.The pretty papers and mirri card make them really festive. These are lovely and all look so different. Your patience of masking the image has paid dividends. hugs mrs A. My goodness me . . . over 100 . . . you have done SO well Kate, especially with completing each one with an insert and matching envelope. Extremely organised of you and very impressive. These 4 are terrific. Making in batches is such a good idea. Thanks for playing along with Rudolph Day. This is a really great stamp, and you have created these perfectly. FOUR??? Well done you - I just managed two!!! Great designs and great Christmas cards! These are beautiful Kate. So pretty. Well done. Kate, these are adorable. You must have quite a stash by now...loved the way your mind worked to create the different colors with this neat stamp. Each one is unique, so what a versatile stamp this is going to be in your hands. Good for you on getting FOUR cards to submit, I've not managed even 2 as yet! TFS & Big hugs. Glad if you enjoyed the fall pictures. My photo skills did not really do justice to the beauty we got to see.